Check in at the Split Rock State Park office with your diver's certification card to get the combination for the gated parking lot. There is plenty of parking for fairly large groups of divers. Please lock the gate behind you. A visitor's overlook with benches is at the top of the wooden stairs. Now wooden stairs replace what used to be a slippery mud and rocky path. 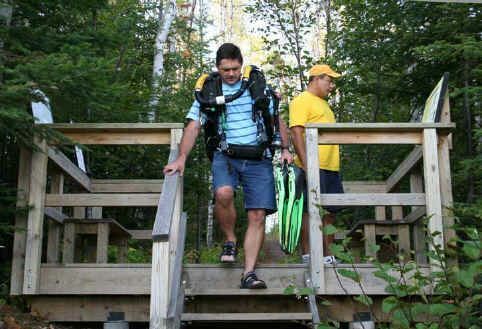 In the summer of 2004, the Madeira access got a major facelift. Gone are the days of parking on the shoulder of Highway 61 then toting all of your dive gear down a long mud path to the stone beach near the site. This summer Split Rock State Park opened it's diver access which includes a gated and paved parking area much closer to the site than the "off-road parking." The path has been improved using a class 5 aggregate and wooden steps have been added over the treacherous rocks. There are also interpretive materials posted on the stair landing. The improved access culminated a series of changes that GLSPS has been working with the DNR and the Parks and Trails Council to achieve. An interpretive sign explains the layout of the wreck around the point. The site map was drawn by GLSPS artist Steve Daniel and donated for use in the signage. 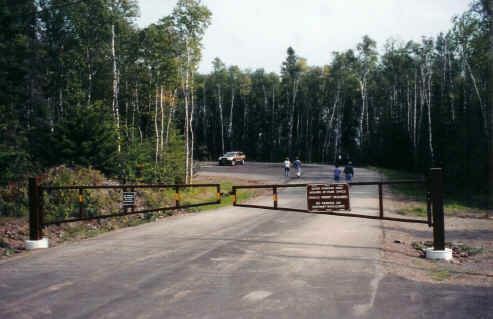 The access improvement began back in 1997 when GLSPS was approached by the Minnesota Parks and Trails Council to support them in acquiring the land parcel including Gold Rock Point for inclusion to Split Rock State Park. The Conco Company, who owned it and who administers the Congdon trust holdings, wanted to sell the property. The last thing we wanted to see was restricted private land and condominiums built on Gold Rock Point. It was one of the few, if not the only, remaining privately owned scenic overlook points on the North Shore that did not have a castle built on it. It was the intention of the Parks and Trails Council to keep it in its undeveloped state. Nowadays the only way that happens is if it is included in a park. The Minnesota Parks and Trails Council is an non-profit organization that works with the DNR to acquire choice land for inclusion in state parks. Minnesota law prohibits the DNR from bidding against private companies for land so the independent non-profit Parks and Trails Council acts as an intermediary and buys the land then willingly sells it to the state. We supported this action, attended meetings, and tried to keep the diving community appraised of what was happening so they could participate in the process. At the time we really didn't have enough money to do much to financially support it. The process was completed on Sept 12, 1998 when the Council turned over the parcel of land to the DNR for inclusion into the park. We were aware that things most likely would change, but have been working with the DNR to make sure that the point stays open even when the park is closed. 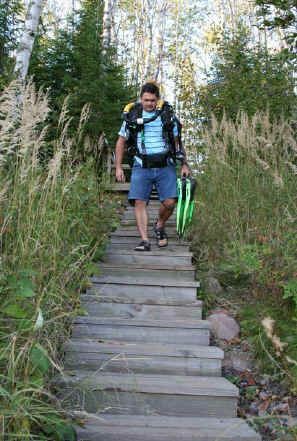 We felt it was a small price to pay to guarantee that the access stays open to divers. 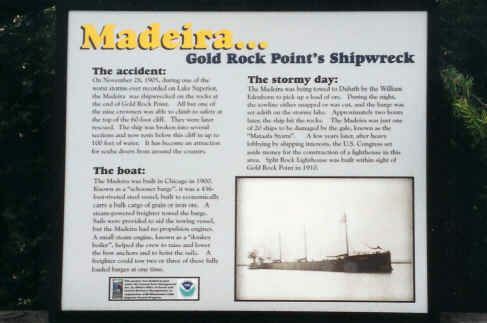 Signage explaining the Madeira history, dive site layout, and diver emergency information is posted at the overlook. After that we worked with the park management making suggestions to improve the access. One of the impediments we hit in that process was that the DNR does not like to develop a public access to a private historical site at least not without a willing owner. At the time the Madeira was privately owned by a corporation created by Lee Opheim, who did some minimal salvage back in the 1960's. Lee died in December 1998. In the spring of 2000 GLSPS secured the Madeira ownership and salvage rights in a donation from Lee's partner Donald Wise, who was administering the assets of the corporation. That cleared the final albeit minor hitch to improving the access. The park showed us the proposal for the improvements several years ago and we made more comments and now the plan has been completed. Our thanks to the DNR and Parks and Trails Council for working letting us work with them in improving diver access to the shipwreck sites of the North Shore. Below are scenes from this really top notch diver access. The goal is to maintain the natural beauty of the area along with improving access. I think the park has done a great job of both. The parking lot at Gold Rock Point has been completed and is available for use. Parking in the Gold Rock lot is available to divers only and was developed to provide divers with a safe access point for transporting gear to the beach. Vehicle permits are required to park in the diver lot. You may purchase a daily or annual park permit at any park office. If you arrive when the office is closed, you may purchase a vehicle permit using self registration. Envelopes are located outside the main park office. Annual permits cost $25.00 and daily permits cost $7.00. 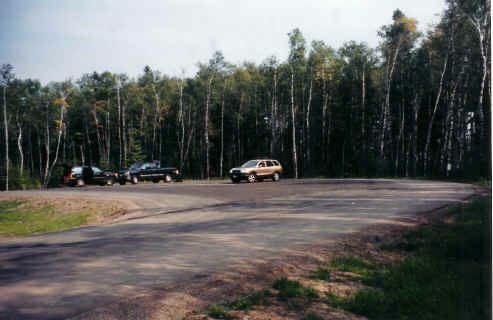 Parking is not allowed on the approach to the gate, or on the Gitchi Gami trail and is not recommended on highway shoulders. This lot was developed specifically with diver safety in mind, so please make use of it. We ask for diver cooperation in checking in at the park office if you are arriving when it is open. Plan to provide your diver’s certification card to verify that you are authorized to use the lot. A combination will be provided to you to access the lot. Office hours are typically 9am-9pm during the main season (i.e. through labor day) and gradually decrease to 9am-4pm. You may call the park office at 218-226-6377 to determine current hours of operation. If you anticipate an arrival when the park office is closed, you may contact the park in advance to provide information and obtain the gate combination. This combination will change regularly. When using the lot, PLEASE LOCK THE GATE BEHIND YOU using the same link of chain. The padlock on the other chain provides access for emergency personnel, so please do not change the locking configuration. It is necessary to lock the gate because the popularity of the new Gitchi Gami bike trail will make it impossible to keep the parking lot from filling and being used as a departure point for bike trips, making the lot unavailable for its intended purpose as a diver access. Intense use of this area has the potential of destroying that which makes it special, i.e. unique botanical resources. While we want to provide a safe access for divers, this area is not appropriate for developing trails or encouraging overuse that threatens the sensitive vegetation. Having divers check in also helps us to emphasize the sensitive nature of the site and to foster an attitude of responsible use and stewardship. We have no way of predicting when divers will need the lot and how many will need to park. If we allow access to some non-divers, we cannot restrict it for others. Capacity of this lot is not sufficient and the area is not suitable for a general public parking area. 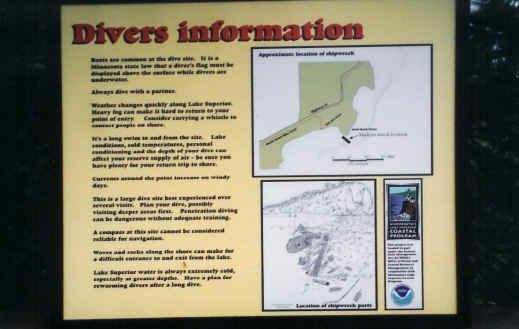 Emergency signage and interpretive information is posted at Gold Rock Point to enhance your experience.